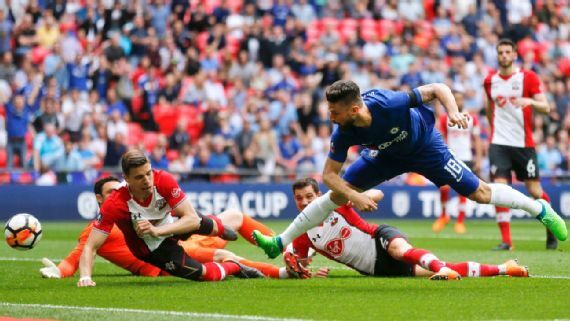 Chelsea comfortably saw off the challenge of Southampton to set up an FA Cup final clash with Machester United at Wembley. It was a composed and assured display from Chelsea and here is how each player is rated in the match. He wasn’t quite composed and convincing as he should be, in the second half he fumbled a cross that should have been a routine catch over the line but was lucky the goal did not count because the referee judged that he was fouled by Charlie Austin. A solid performance typical of Azpilicueta, he was defensively efficient, powerful and faultless. He delivered an inch-perfect cross from the right for Alvaro Morata to head home the second goal. He has found game time hard to come by this season but has looked very solid in the couple of matches which he has started so far and today was not an exception. He was calm and composed in defence for the Blues. The Germany international had a solid game in defence for Chelsea, in the few times he was put under pressure by the Saints attackers. The Nigerian was a hard worker all through the match, he worked his socks off down the right side of the midfield. Much better performances coming from Victor Moses just at the tail end of the season. A combative display full of energy like always, he was the outlet for all Blue’s play. Another fine performance in midfield from the French man. He is the pass master and the Spaniard pulled the strings in midfield for Chelsea. His ball into the box which was controlled by Hazard and played into the path of Olivier Giroud led to the opening goal in the first minute of the second half. He looks good at the left side of midfield, he was lively and full of running, always ready to support the attack. Defensively he might still need to work harder to justify a starting berth. The Brazilian was lively in the first half, hitting the bar with an early strike and the top of the net with a free-kick. It was a big surprise that he was substituted, most fans were not equally happy that he had to leave the match at that stage. However, It was a good performance for Willian. This was Hazard at his mesmerising best, he was electrifying with the ball at his feet. He set up Giroud for the opening goal after a superb piece of control, was denied a goal by a fine save from Alex McCarthy. He was just too hot for Southampton defenders to handle every time he had the ball. He showed his worth with the goal, meandering through a sea of Southampton defenders as well as the Saints goalkeeper Alex McCarthy before stabbing the ball home. His hold up play and the all-around display was commendable. He did not do badly after replacing the highly effective Willian in the second half, this was a substitution that shocked many Chelsea fans. Although he was a bit shaky and lacked composure in midfield, he was still able to do the simple things right. He made an immediate impact after coming on for Olivier Giroud, he calmly headed home a right-wing cross from fellow Spaniard Azpilicueta. Morata nearly scored a second but was denied by a save from McCarthy and a clearance off the line by Maya Yoshida. He came on for Cesc Fabregas in the 76th minute, he didn’t make any considerable contribution worthy of mention.